Look stunning in gold -- this adjustable bolo slide bracelet fits wrist sizes 5.5 to 8 inches. Engrave front and back of tag with a name, message, monogram or custom symbol. This custom bracelet looks fabulous paired with a little black dress, office attire, casual beach wear and more! 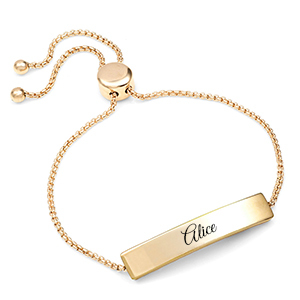 It's made of 14k gold plated stainless steel, so you can count on it lasting with daily wear!